WHAT IS IT? The Model TA-TPS is a tripper position switch, which is a heavy duty limit switch commonly used to aid in positioning of the "tripper" on a conveyor with multiple discharge points or discharge chutes. The output contacts of the Model TA-TPS can control up to two separate circuits, one for machinery shutdown and one for an alarm. WHY IS IT NECESSARY? The Model TA-TPS is relatively inexpensive protection that provides benefit by saving the time, money, and labor associated with bulk material transfer. Note: Tripper Position Switch or Tripper Position Control. The roller is a heavy duty white acetal material of 3" diameter. The SP/DT units have a dry, unpowered microswitch(es) rated for 20A @ 120 VAC, 240 VAC, and 480 VAC. The roller arm can move up to 90 degrees in either direction. Roller is spring loaded to automatically reset itself. 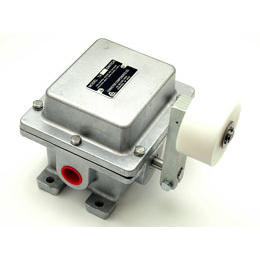 The general purpose units are designed NEMA Type 4/4X weatherproof and corrosion-resistant, and NEMA Type 5 dust-tight. Explosionproof units are designed NEMA Type 7/9 for dust ignitionproof and vapor explosion proof. The dual-rated "D" units are designed NEMA Type 4X weatherproof and NEMA Type 9 dust ignition proof. UL listing and CSA certification is pending.